Heat oven to 350°. Spray 2 cookie sheets with cooking spray. Stir Bisquick mix, milk, cheese and olives until soft dough forms. Place dough on surface dusted with Bisquick mix; gently roll in Bisquick mix to coat. Shape into a ball; knead 10 times. Divide dough into 15 equal parts. Roll each into a breadstick about 8 inches long. Place on cookie sheet. Brush egg over dough. Bake 11 to 14 minutes or until light golden brown. Serve warm with olive oil or marinara sauce for dipping. 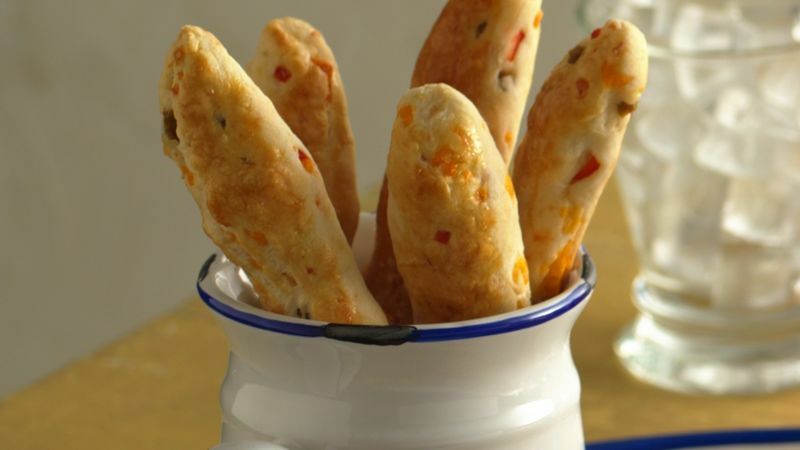 If your family likes green olives, these tasty breads will be a hit at your house. They're great with any soup or salad or as a fun snack.